It is with great regret that we announce that Mrs Molly Isherwood, the inspiration behind this website, died peacefully this morning (22nd February 2014). Molly was the sister-in-law of James Lawrence Isherwood and since his death in 1989, she worked tirelessly to ensure that his work came to the attention of a wider public. She kept her promise not to sell any paintings until three years after his death. She then organised several successful exhibitions in Wigan and Southport, taking satisfaction seeing people who had rejected his work in life eagerly queuing to buy. Molly Isherwood was a caring and kind-hearted lady who had known Isherwood since she was a teenager and watched the controversies in his artistic career with quiet dignity. Throughout her long life, she truly believed that Jim Isherwood was a great, unique artist. 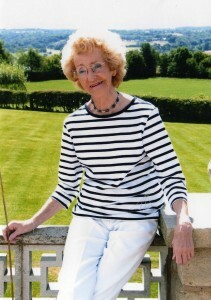 She became ill whilst on a cruise with her partner Peter last autumn, and since then waged a brave war against leukaemia. The funeral took place at 10am Wednesday 5th March, at All Saints Church, Finch Lane, Appley Bridge. Followed by cremation at Charnock Richard. OUR SINCERE SYMPATHY GOES TO PETER, HER SON CLIVE, DAUGHTER-IN-LAW MARGUERITE, GRANDCHILDREN AND GREAT GRAND CHILD. The Isherwood family would like to thank everyone that gave donations to the Macmillan Nursing Fund at the Royal Albert Edward Infirmary, Wigan, in memory of Molly. 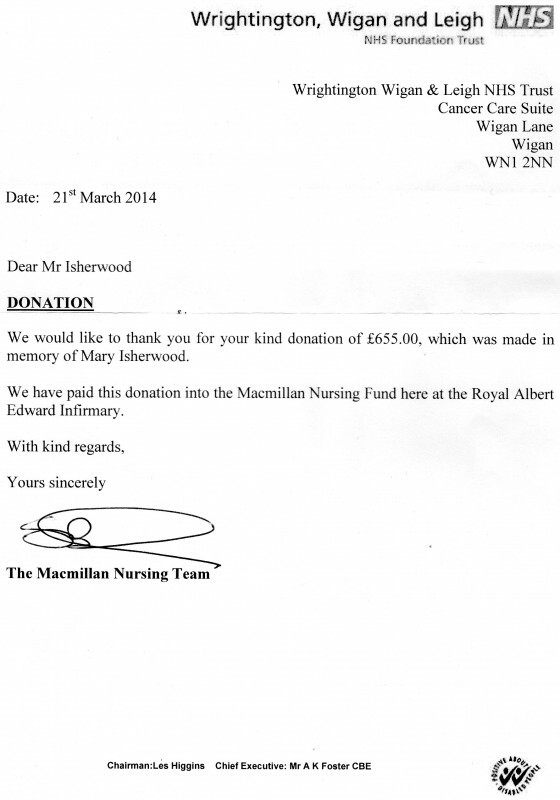 A copy of the thank you letter can be seen here.